“If the storms of life seem too much to handle… if your day to day has become more like a fight for your life… if you are bored, and tired of being uninspired… then come with me to the “Other Side”. This essay will be a revelation to you. Much more than simply revealing who, and what the demoniac “Legion” is in scripture. This paper that I am writing this morning for all of you is a key of sorts. A KEY that will open the doors of your understanding. The “Other Side”, you will find is simply a way of overcoming your present trials. It is to get to the OTHER SIDE of your life. It is to CROSS over from death (which is ignorance) to life (which is wisdom). There is a great saying that you may or may not have heard of. It basically puts forward the idea that when you are going through a difficult time, or trials in your life, that “you will eventually get to the other side of it”. As if your troubles are a large dangerous mote filled many deadly, and terrifying things, that you simply have to CROSS over to enter the Kingdom on the “other side”. And this essay will help get you from here to there. Because today, sadly, that is exactly how life seems to be for “MANY”. One gigantic mountain, or valley, or sea of trouble that you are simply dying to get to the “other side” of. Does is not at times seem like we only go from one trial to another? Like our sole purpose for existence is to simply duck and cover and dodge and weave everything that life throws our way. At times… doesn’t it seem like this is just simply the way it is, and the way it will always be? Do you ever beat yourself up for not being able to break the chains that this world shackles you with fast enough? Well, if this is so, know that you are not alone. Because there are MANY like this today. Never the less, together, I promise you, we are going to get to the “Other Side” of it. Now, there is a reason I bold/highlighted the word “MANY” above. As we dig into Mark Chapter 4 and 5 we are going to find this word “MANY” to be one of those keys I was bragging about earlier. Mark 4:33 And with many such parables spake he the word unto them, as they were able to hear it. 34 But without a parable spake he not unto them: and when they were alone, he expounded all things to his disciples. I have found in my life that I cannot simply go over to people and flat out tell them what is wrong with them. Many times when I counsel people I know they are not ready to face their real problem, much less take responsibility so they can overcome it. And so to these people, I talk in mysteries. Instead of telling them that they are envious and insecure and filled with fear I share a story about myself that relays the dangers of living a life this way. I talk in parables if you will. Much like Jesus. In fact, I believe I got that trick from Jesus. For example, if someone is an exaggerator instead of flat out telling them this, I might recite “the boy who cried wolf”. Get my point. Now in verse 33 it is clear Jesus constantly spoke in parable, the question is why? However, we do find something interesting here… to the disciples… to those that were READY to hear what Jesus had to say… those parables made sense. The spirit of the story gave them life and because of this he no longer needed to MASK his WORDS. This my friends is the day we are entering into now. When I began sharing my essays years ago, few people were ready for what it was I had to share. This is why I too am saying to those “disciples of truth” who understand the spirit of what I am sharing, when HARD TIMES come let us pass over to the OTHER SIDE of it. 35 And the same day, when the even was come, he saith unto them, Let us pass over unto the other side. Notice, how Jesus said, “Let us pass over” when the EVENING was come. At first glance, this may seem innocuous, but I assure you there is treasure in every hill and valley of scripture. The EVENING, also known as Night or Darkness in scripture, is an allegory of IGNORANCE. You can’t see in the dark. Also, not the safest way to travel if this story is taken literally. Let us look at this from a different angle as well. What is the “other side” of Night? That’s right the answer is DAY! The “other side” of Darkness is Light. And of course, the “Other Side” of trouble is peace. Now to DO THIS… you are going to have to change. The definition of insanity many would say is doing the same thing and expecting a different outcome. If you are unhappy, unfulfilled, if you feel stuck and misery keeps you up at night… It is time to change. The world and those in the world, will lead you to believe that your problems are because of others, outside influence, and while on the surface that may seem to be true, I assure you your problems are your own. And YOU can get to the Other Side of them. However, to do so, you cant continue to live the way everyone else does. You can’t be selfish, greedy, condemning, or rude, you MUST die to that way of thinking first. One must first depart from WHAT EVERYONE ELSE BELIEVES… Those who DON’T want to cross over will stand their ground. But you my friend must journey elsewhere… And if they want to keep you where they are, it is time for you to send them on their way. You can’t get to the Other Side if you are still with those who don’t want to cross over themselves. It is true the ways of the world lead to destruction. Look at our world today. Look at your own life. Is it not filled with bitterness at times? Is it not filled with envy, fear, regret, and anger? I tell you the truth, for me, at times it is… and that is why I LISTEN WHEN I HEAR THE CALL TO PASS OVER UNTO THE OTHER SIDE. It doesn’t bother me that I think and act differently from the rest. It used to, but no longer. It does bother me that a majority of those who claim to know God are some of the most selfish, arrogant, greedy, manipulative, condemning, judgmental people there are. Straight is the gate and few there be that find it. However, you are not like everyone else. You are here today reading these words. YOU MY FRIEND ARE A DISCIPLE OF TRUTH… like me. And like me, you too have SENT AWAY the MULTITUDE and carried the TRUTH (Jesus) in your heart to get to the Other side. And in doing so, you, like me, find many others following along, little as they may be. 36 And when they had sent away the multitude, they took him even as he was in the ship. And there were also with him other little ships. I have written on the “Other Side” before, if you want use the search bar to get more eye opening info about this parable. However, I will touch on a couple of symbols that will help before I continue. I have to remind you that we must take our eyes off a literal man named Jesus for a second. Look at Jesus the way he described himself to the “disciples”. So, we must look at Jesus as the TRUTH within each of us. In this particular story the SHIP or VESSEL carrying the TRUTH must then be seen as our soul, our identity. So when you read about the WAVES beating against the SHIP and the great STORM of wind below… You understand, YOU are the ship that the TRUTH is traveling in… to get you to the OTHER SIDE. 37 And there arose a great storm of wind, and the waves beat into the ship, so that it was now full. YES, these are the storms of life that we, each of us, face. And it can be scary when it seems like all hell has broken loose. But when that happens, we REMEMBER just who and what is traveling with us. 38 And he was in the hinder part of the ship, asleep on a pillow: and they awake him, and say unto him, Master, carest thou not that we perish? We WAKE IT up… WE CALL UPON IT…WE SCREAM LORD HELP US… Especially if we believe WE WILL PERISH! And in that moment, when all hope seems lost, the revelation REVIVES and the WIND (troubling thoughts) is rebuked. 39 And he arose, and rebuked the wind, and said unto the sea, Peace, be still. And the wind ceased, and there was a great calm. The other day, I was delivered some news. This news did not sit well with me, as I have never been a big fan of change, ironic as that may seem. Ignorantly, I allowed a bit of fear to creep into my heart about this situation. And it wasn’t long before that fear turned into an emotional storm within me, a storm with waves of negative thoughts that somehow seemed to predict the worst of future outcomes. And as I ignorantly followed after the enemies (carnal mind’s) many temptations I too found myself thinking, “doesn’t anyone care that this could ruin everything?”… It was then, the TRUTH woke up inside me… I even laughed, because I realized I WAS being FEARFUL and that I AT THAT MOMENT HAD FORGOTTEN TO HAVE FAITH. 40 And he said unto them, Why are ye so fearful? how is it that ye have no faith? And IN THAT INSTANT… the storm was gone. No more crazy thoughts running wild in my head. No more negative ideas of what might be, or what I might have to do… “Peace be still!” I yelled… I shook it off… and there was CALM. … Resist the devil, and he will flee from you. If YOU resist the tormenting LIES in your mind… they will leave you! Just remember my friends, IN THIS WORLD YOU WILL HAVE TROUBLE. We are IN the FLESH. We are an infinite projection in a temporal distortion. We are LIGHTS in vast darkness… so it is not always going to be easy. But if we continue to follow after the truth, it will be much more than simply worth it. Now here is where the story gets interesting. 5 And they came over unto the other side of the sea, into the country of the Gadarenes. THIS LINE RIGHT HERE is a treasure hiding in plain sight. By now we know the OTHER SIDE is the ANSWER to our PROBLEM. It is then of no coincidence that when the DISCIPLES OF TRUTH came over to the OTHER SIDE the NAME OF THE COUNTRY was GADARENES, which literally means “the Reward At The End”. Isn’t that something? When you go to the “Other Side” of a problem you find a REWARD AT THE END. This is true for everything in life. Now let me tell you what you find on the Other Side… You find many, many, people who are hurting and thinking the wrong way. Possessed by the many lies they hear and say. You find that most people, MANY people, are hurting. Their life is more like death. They are often bound by their many problems. Let me explain what an “unclean spirit is” — it is not some spooky monster or Hollywood demon. An un-clean spirit is simply a thought that is not pure. And if it is not pure it is a lie. Jesus said, “my words are spirit”. Words/Thoughts these are SPIRITS. And today people are possessed by MANY LIES which is why so MANY PEOPLE are crying out this same way. The STONES are religious laws, condemnation, shame, and judgment. And thou shalt write upon the stones all the words of this law very plainly. Ironically, Legion “The Many” want to be saved, this is why they dwell in tombs. Symbolic of religious ideas and traditions. The white washed tombs many dwell near and in are the religions of this world. Which is why they can’t comprehend the plain speak of Jesus or Me. This is why they need the parable. They are lost. The MANY see Jesus Far off. Meaning, MANY Christian’s today believe Jesus is FAR, FAR AWAY and they are waiting for him to come soon. Worse then this, they believe THEY, and this JESUS, they worship have nothing in common. And worse than that… is the MANY/Legion believe this very same Jesus only wants to punish. They see the “savior” as a judge who persecutes and tortures not one who heals. 8 For he said unto him, Come out of the man, thou unclean spirit. 9 And he asked him, What is thy name? And he answered, saying, My name is Legion: for we are many. When you come to the OTHER SIDE of your faith and you look around the world you will see MANY people like Legion. For they are MANY. They are living a life of death (ignorance). The good news is, when the MANY see you… they will WANT to change. When you show them love instead of condemnation. When you remind them that THEY TOO can get to the other side and find that reward waiting there. Now not all will want to leave. MANY may want to stay where they are comfortable. That is because lies when cast out of people can still find a home in the swine (unbelievers). When you cross over the lies that were cast out of you, like eternal torture, a rapture and more, are still welcome elsewhere. You may find these lies that once possessed us are welcome by the great herd of SWINE (UNBELIEVERS) in the land. This is the meaning behind the story. We are not to waste our pearls before swine. Because in the end, it is the only place lies are welcome and the truth is despised. However, when one SINNER (person who is ignorant) repents (becomes wise) people WILL talk about it. The SHEPHERDS of the SWINE especially. When someone who is truly out of their mind, who is truly miserable and depressed, addicted, and stressed, finds REST… PEOPLE TAKE NOTICE. They say to themselves, how is it possible that this person who was so messed up is FINALLY AT PEACE? Well, that is what happens when you get to the Other Side people. It happened to me. If it hasn’t yet happened to you, be of good cheer because it will. And trust me, the SHEPHERDS of the SWINE may not like that. Because there you sit, at peace, IN YOUR RIGHT MIND… and you didn’t eat a word of what they were selling. Because only THE TRUTH sets a person free. And that TRUTH is right there in the hinder parts of your vessel (mind/heart) waiting for you to WAKE HIM UP. Just like I did, the moment the waves beat against my ship. Because of it, I find peace and joy and truth and I find I am finally in my right mind (righteousness). I am LEGION no more. And soon you will find, neither are you. P.S. 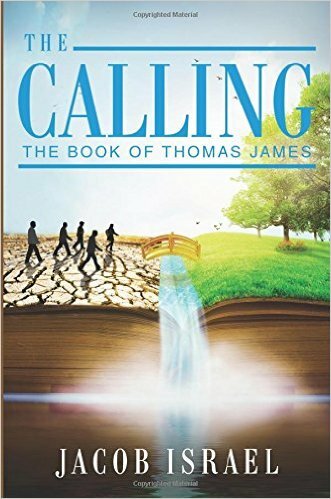 remember the re-launch of THE CALLING, the book of Thomas James is fast approaching. It is the novel I was meant to write. 35,000 new words, new chapters, never before scene poetry and insights that will blow your mind.